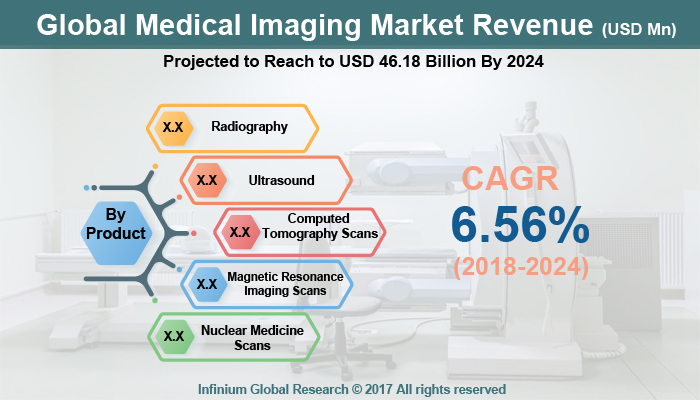 A recent report published by Infinium Global Research on medical imaging market provides in depth analysis of segments and sub-segments in global as well as regional medical imaging market. The study also highlights the impact of drivers, restraints and macro indicators on the global and regional medical imaging market over the short term as well as long term. The report is a comprehensive presentation of trends, forecast and dollar values of global medical imaging market. According to report the global medical imaging market is projected to grow at a CAGR of 6.56% over the forecast period of 2018-2024. The global market size of medical imaging market was worth USD 29.48 billion and it is projected to reach to USD 46.18 billion by 2024. Major components driving growth in the medical imaging market includes rising age demographics, growth in the incidence of various diseases and increasing awareness for early stage chronic disease detection and diagnosis. Also factors such as increasing investments and grants by government bodies for modernization of imaging facilities and technological advancements in diagnostics imaging modalities are too responsible to augment growth of medical imaging market. However factors such as high cost of diagnostic imaging system and technological limitations associated with stationary/ standalone imaging systems to hinder the growth of the medical imaging markets. File Sharing ecosystem and growing adoption of mobile and portable medical imaging devices are the major factors that can further create huge growth opportunities for the medical imaging market. Among the regions, North America has the dominant market share among other regions. The U.S accounted for the highest market share owing to presence of major leading medical imaging diagnostic companies and introduction of new products in these region. Furthermore, rising number of diseases coupled with high expenditure on healthcare by U.S citizens are also some of the influential factors responsible to drive growth of medical imaging market in this region. Asia Pacific is expected to grow at the fastest rate over the forecast period owing to development of healthcare facilities, increase government initiatives and growing medical tourism in APAC countries. Japan has the highest market share in the medical imaging market owing to presence of companies catering into medical imaging devices and technological advancement made by these companies. The report on global medical imaging market covers segments such as, product, product type and end-user. On the basis of product the global medical imaging market is categorized into radiography (X-ray), ultrasound, computed tomography scans, magnetic resonance imaging scans and nuclear medicine scans. On the basis of product type the global medical imaging market is categorized into portable and stationary. On the basis of end-user the global medical imaging market is categorized into hospitals and imaging centers. The report provides profiles of the companies in the global medical imaging market such as, GE Healthcare, Siemens Healthcare, Shimadzu Corporation, Koninklijke Philips N.V, Carestream, Toshiba Medical System Inc., Ziehm Imaging Inc., Aribex Corporation and Varian Medical Systems. The report provides deep insights on demand forecasts, market trends and micro and macro indicators. In addition, this report provides insights on the factors that are driving and restraining the global medical imaging market. Moreover, IGR-Growth Matrix analysis given in the report brings an insight on the investment areas that existing or new market players can consider. The report provides insights into the market using analytical tools such as Porter's five forces analysis and DRO analysis of medical imaging market. Moreover, the study highlights current market trends and provides forecast from 2018-2024. We also have highlighted future trends in the medical imaging market that will impact the demand during the forecast period. Moreover, the competitive analysis given in each regional market brings an insight on the market share of the leading players. This report will help manufacturers, suppliers and distributors of the medical imaging market to understand the present and future trends in this market and formulate their strategies accordingly.